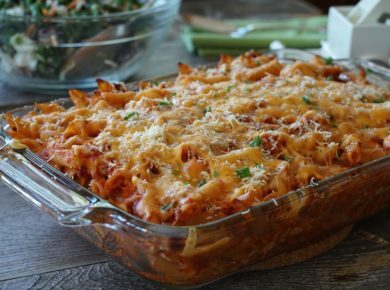 Takes 25 Minutes , serves 2-4. Prepare the vinaigrette: Whisk together the ingredients for the vinaigrette in a small bowl and set aside. Prepare the tuna: Rub the outside of the tuna with oil, salt and pepper. 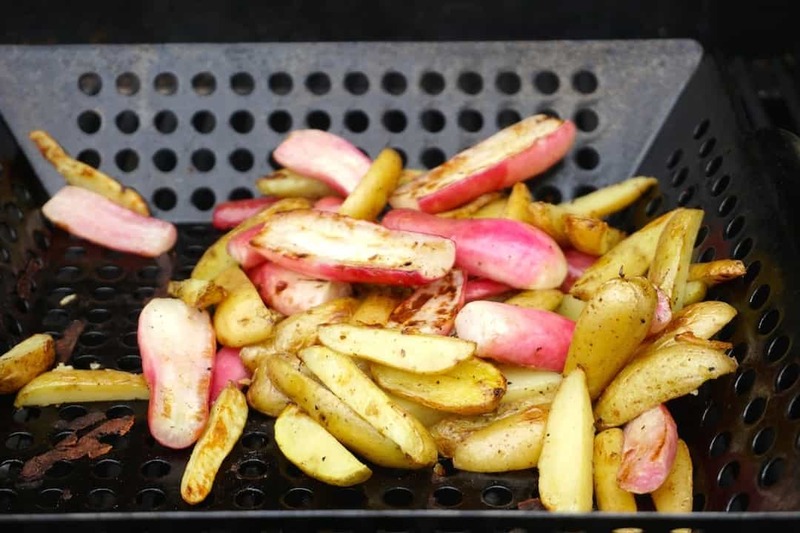 Grill the potatoes and radishes: Preheat the grill to 500°F. Toss the prepared potatoes and radishes in a drizzle of extra virgin olive oil, salt and pepper. 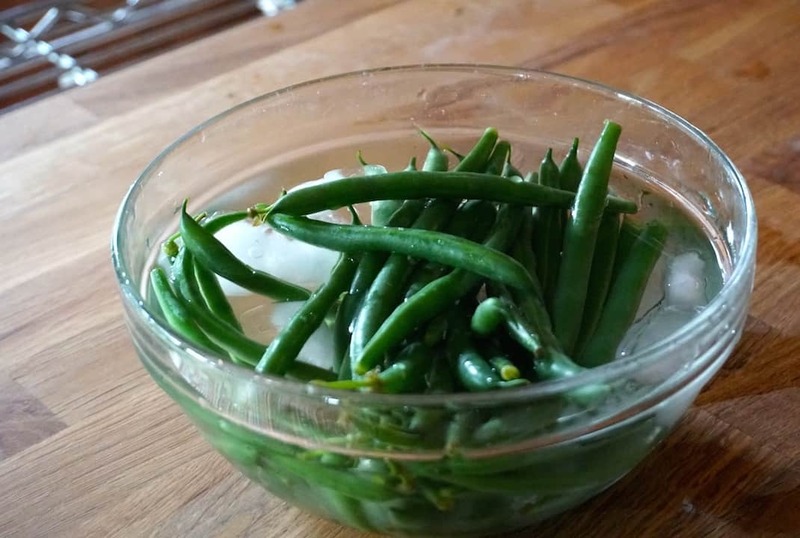 Place these vegetables into a grill basket and cook for about 6 minutes, tossing the vegetables every so often as they cook. Remove from heat and transfer to a medium-sized bowl. 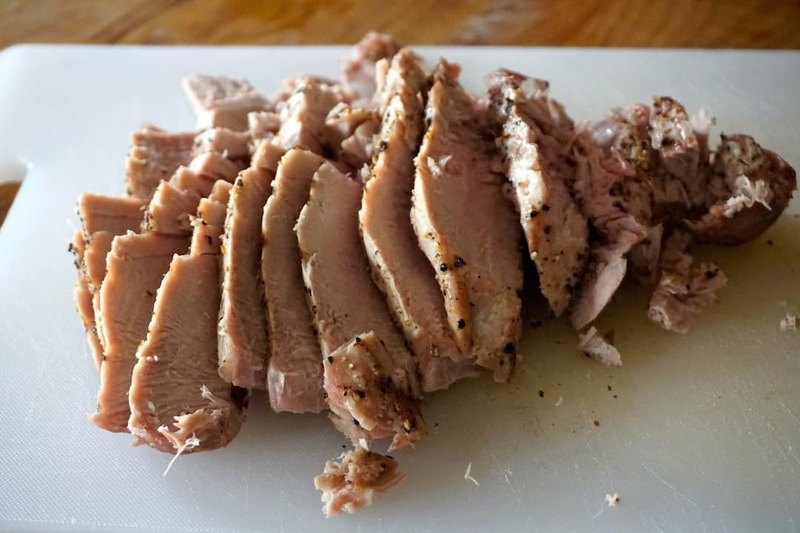 Grill the tuna: Place the tuna onto the grill and cook to desired doneness - 1 minute per side for medium-rare or 2 minutes per side for medium. Remove from grill, slice and reserve. Prepare the salad: Add the remaining vegetables to the bowl of potatoes and radishes and toss. Whisk the vinaigrette, then add half to the bowl and gently toss again. Taste and season with salt, pepper and additional vinaigrette, if desired. To serve: Create a collar of microgreens around the rim of each luncheon or dinner plate. Spoon the salad onto the centre, topped by a few slices of the grilled tuna. Spoon additional vinaigrette over the top of the salad and garnish with a few additional bits of salad and a sprinkle of black pepper. Serve immediately. 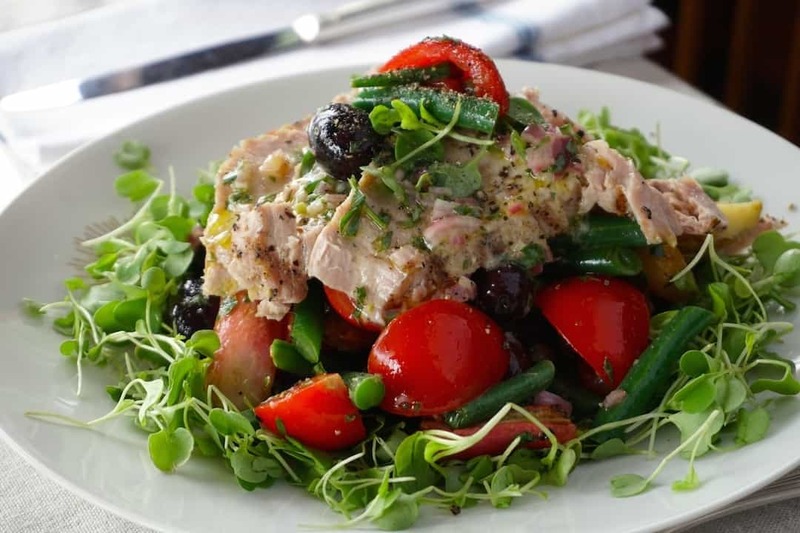 This attractive GRILLED TUNA SALAD provides big flavour with little effort. 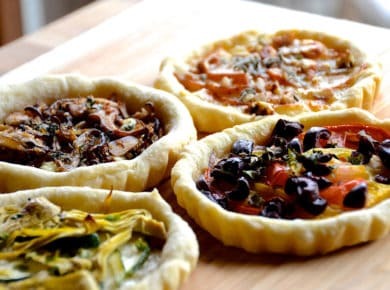 Give it a go and you’ll be savouring every bite. 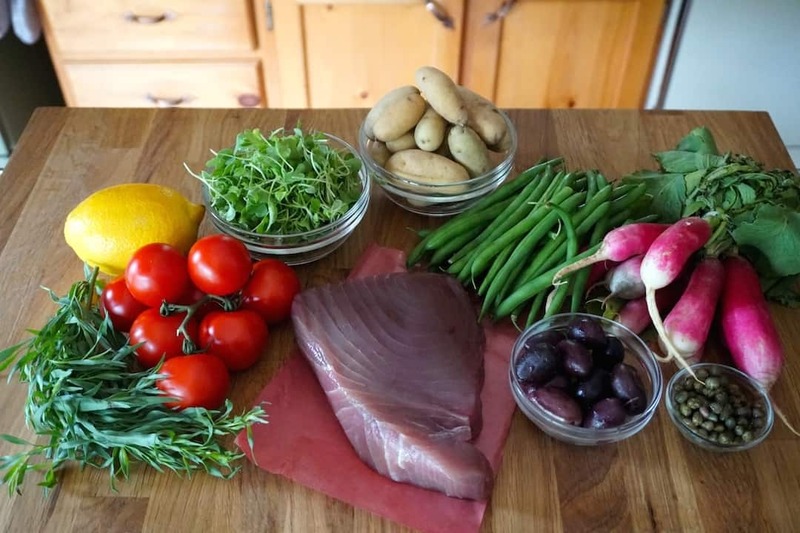 The idea for this GRILLED TUNA SALAD recipe started a month ago; friends were up for the weekend and served up a lovely, fresh-tasting seared tuna sandwich. The lunch was so memorable, it immediately had me thinking about other applications for a piece of freshly-grilled tuna. The salad is essentially a cross between our SALADE NIÇOISE and our CHOPPED SALAD. 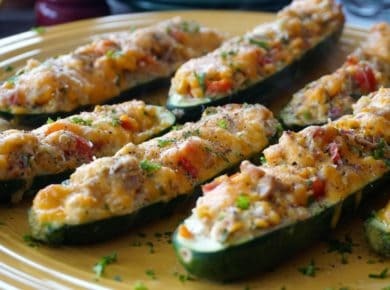 I think it perfect for a warm summer day and I especially like how it delivers big, bold flavours while also garnering great praise for presentation – it looks so attractive on the plate. 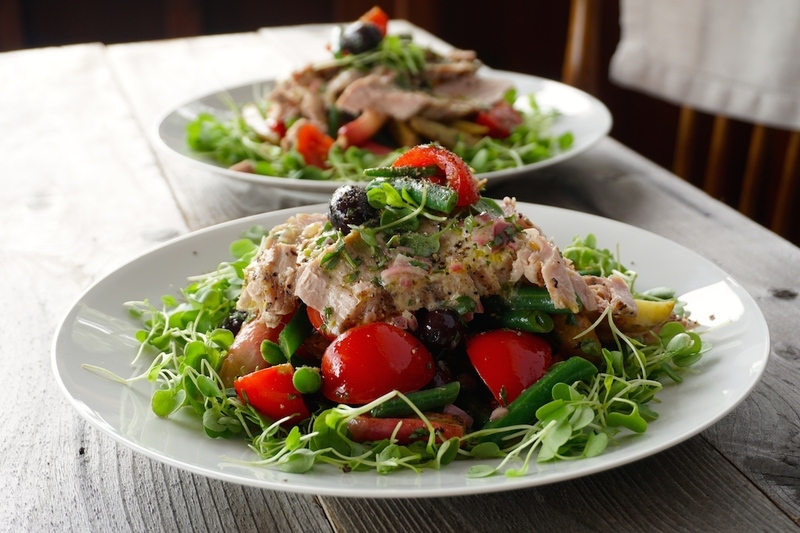 Here are a few simple things to keep in mind when you go to recreate this GRILLED TUNA SALAD. THE TUNA – I’d better note from the outset that I’m simply not a fan of tuna served medium-rare; it reminds me of sushi, and I’ve never been a fan. That said, serve this tuna all fancy, seared-style if you wish, but I think it way more flavourful cooked medium. I’ve offered two different grilling times for you in the instructions below. 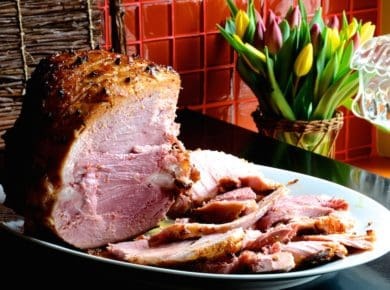 I think it fabulous either way as it remains wonderfully juicy and extremely flavourful. 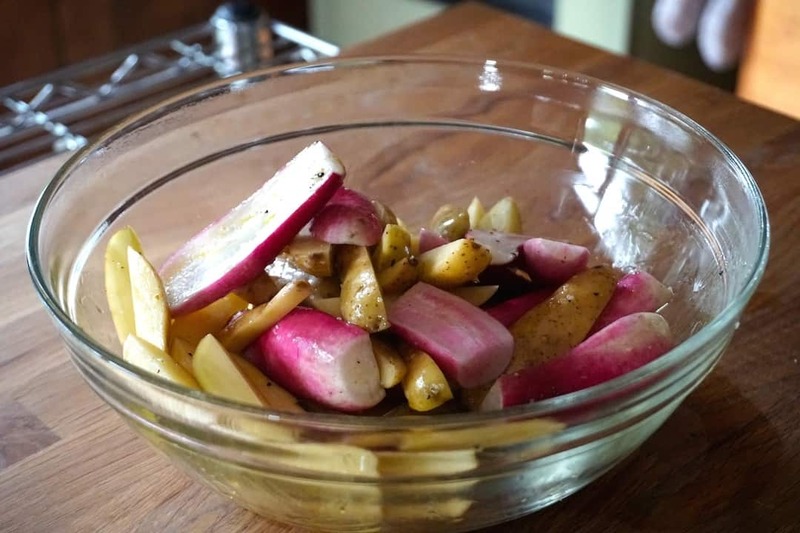 POTATOES AND RADISHES – Adding grilled fingerling potatoes into the tossed vegetables is my nod to the Niçoise, while grilling the French breakfast radishes simply achieves my goal of preparing seasonal vegetables in new ways. Grilling the radishes also adds a nice tang to the salad. 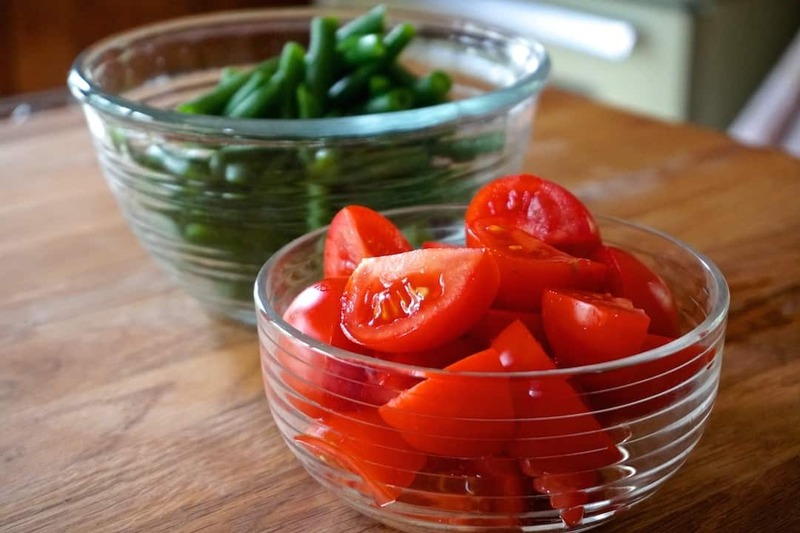 TOMATOES AND BEANS – Vine-ripened tomatoes and blanched green beans add a hit of vibrant colour, and when partnered with the capers, they make each bite noteworthy. 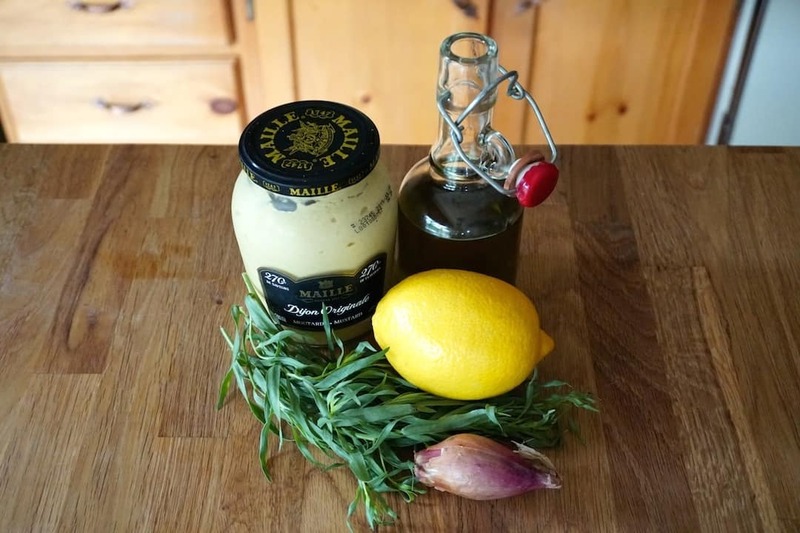 VINAIGRETTE – I purposefully kept the vinaigrette for this salad as simple as possible. Just whisk the ingredients together and enjoy. Don’t forget to save a bit of vinaigrette to spoon over top the salad right before you serve, making for a lovely finishing touch. SERVICE – Two things to consider when you go to serve: I’m suggesting a collar of baby arugula microgreens as the foundation on your plate for their peppery bite. I also think this salad can be enjoyed as a luncheon main for four, or as a more substantial main for two. 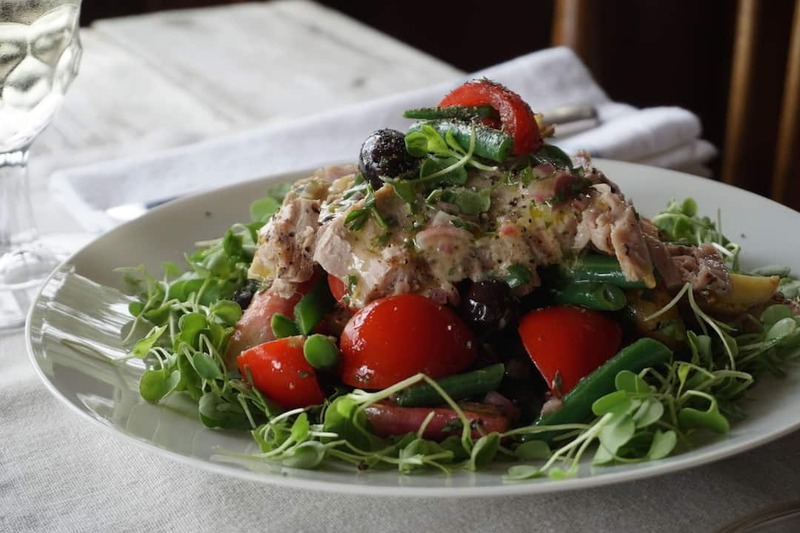 Looking to pair this GRILLED TUNA SALAD with something equally delicious? Try it alongside a cold soup, whether our GAZPACHO or CHILLED CUCUMBER SOUP. These healthy pairings may even leave you with a bit of room for dessert, so think WILD BLUEBERRY PIE! Grill up a piece of this rich-tasting fish and present it on our colourful, flavour-packed salad. 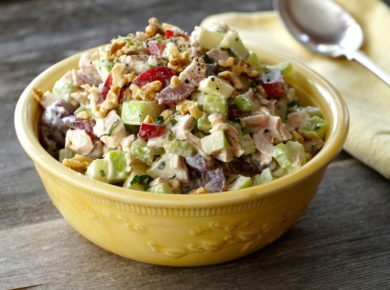 GRILLED TUNA SALAD is guaranteed to please.